Frodo and Sam started their long trudge in THE LORD OF THE RINGS: THE FELLOWSHIP OF THE RING on Dec. 19... On TV, it was art imitating life as Kiefer Sutherland began chasing terrorists every week on 24... And a little gadget hit Oct. 23 that changed the world — yep, that's when Apple launched the iPOD, which has had us burying our faces in tiny screens ever since. That terrible Tuesday dawned at Inlander HQ as we were finishing our annual Fall Arts Preview. Reeling at the news of the ATTACKS ON NEW YORK AND WASHINGTON, D.C., along with the rest of America, we switched it up and added as much news as we could to inform our readers. As the week of Sept. 11 unfolded, with everyone desperately wanting to know more, we published our first and only EXTRA edition, with more stories, including one about someone named Osama bin Laden. 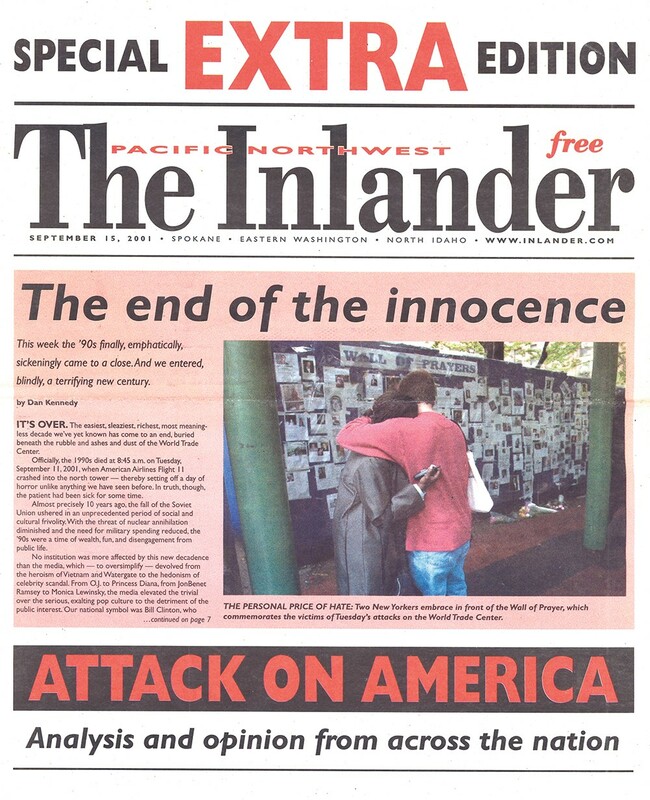 As the aftermath unfolded, we devoted five straight weeks to covering the moment that changed our lives. A week into March Madness, Gonzaga was coming off two Cinderella seasons and two tournament wins (against Virginia and Indiana State). It was not yet clear whether this run would be a blip on the NCAA radar or something special — and lasting. For our March 22 issue, we went with the latter, declaring Cinderella a myth and the Zags a "DYNASTY." With Casey Calvary a senior, Blake Stepp a freshman and Mark Few in his second year in charge, they had another great tourney, just losing to powerhouse Michigan State. It was a preview of the glorious years to come, and we've stayed with the story, with annual Zag coverage every fall and spring, peppered with player profiles in the weeks between. Did we really need a Jan. 4 cover story on H.R. PUFNSTUF? Probably not... We marked the start of the CRAFT COCKTAIL CRAZE that has swept Spokane with a profile of mixologist Paul Harrington on March 15... And in one of the craziest tales ever, on April 5 Jack Nisbet related how a Latah, Washington, farmer pulled a nearly complete MAMMOTH skeleton from a bog in 1876. 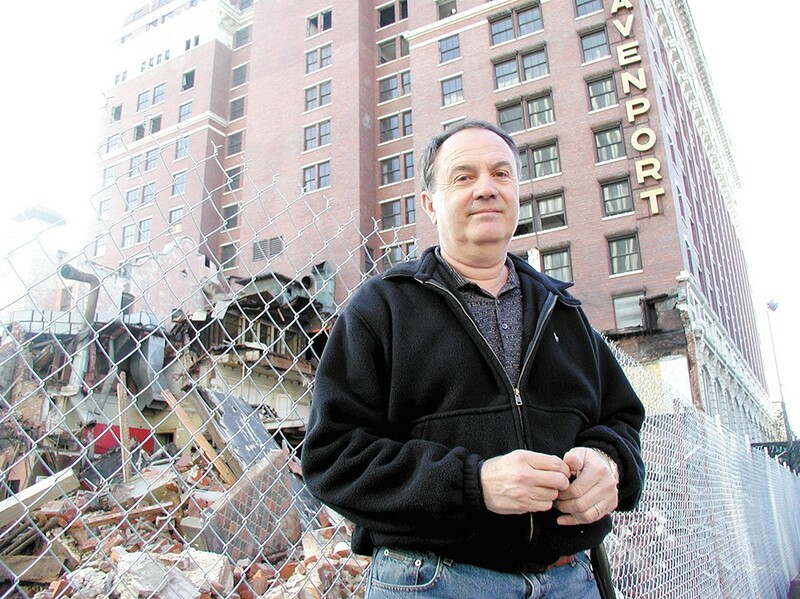 WALT WORTHY, the dreamer who was knee deep in saving the Davenport Hotel, landed on our cover March 8... At 82, Spokane's EVA BIALOGROD told the harrowing tale of living through the Holocaust in Poland — "I was not a hero," she told the Inlander on Aug. 16. "The heroes defied the Nazis, and they were shot"... And on Dec. 20, ED TSUTAKAWA traced his life from a WWII Japanese internment camp to becoming a leading Spokane citizen. The original print version of this article was headlined "THE YEAR THAT WAS... 2001"